Lama Jigme Rinpoche is the spiritual director of Dhagpo Kagyu Ling in France and spiritual counsel to the Diamond Way Foundation. In 2011, Lama Jigme Rinpoche was appointed by Karmapa Thaye Dorje as General Secretary of the Karma Kagyu School. 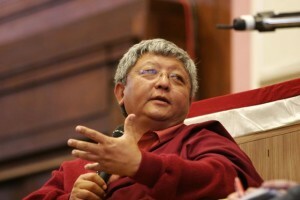 Lama Jigme Rinpoche has visited the UK to teach several times at the invitation of Diamond Way Buddhism. The first occasion was in 2005, during the historic first visit of Karmapa Trinley Thaye Dorje (click here for report). Subsequently Jigmela taught during Karmapa Thaye Dorje’s 2012 visit to London (click here for report), and in 2014 at the time of the opening of the new London Centre (click here for report).